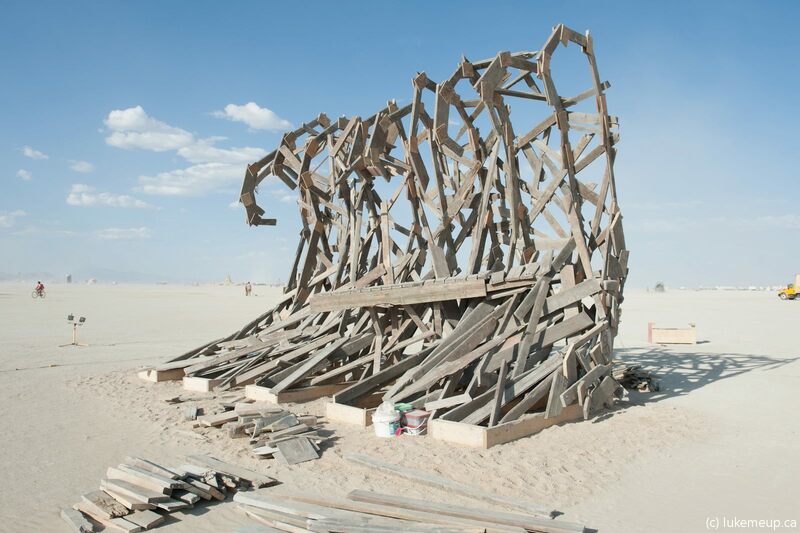 The Breaking Wave sculpture is now part of Burning Man history. 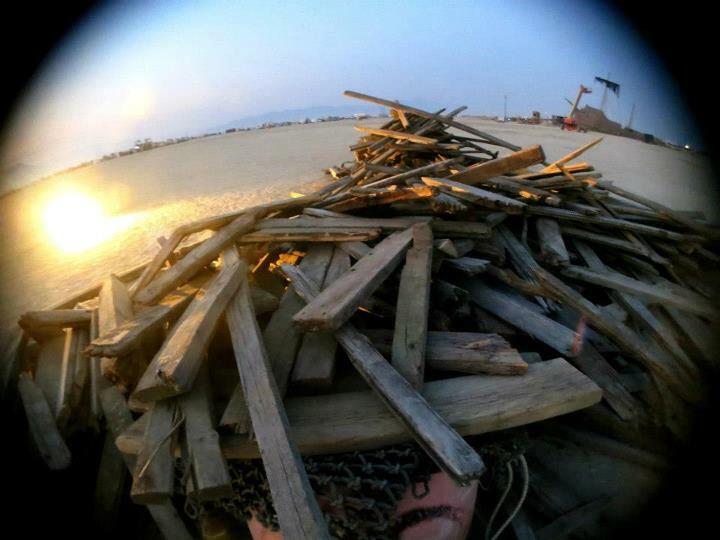 After months of planning, preparation and wood gathering, the Wave was assembled and built in two nights on the playa. Since the daytime temperatures hovered around 100 degreesF. with blowing dust, we chose to work from sundown to sunrise using portable halogen lights. The sculpture weighed approximately two tons when completed, 16 feet high, 20 feet long and 10 feet wide. The construction of the 10 support trusses and 5 box foundation frames took about 48 hours to construct at our home base, in Squamish British Columbia, Canada, about two months before Burning Man. On the playa the support trusses were erected on the base frames and then about 5,000 pieces of drift lumber of a wide range of sizes were screwed to the trusses. 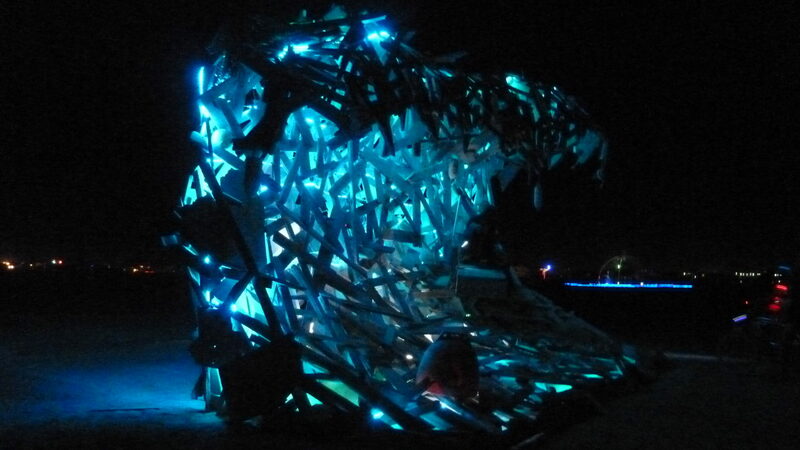 The Breaking Wave Team, with helpers, spun LED strip lighting and an array of strobes through the structure which delivered an amazing effect at night, powered by a generator we positioned about 150′ away from the sculpture. 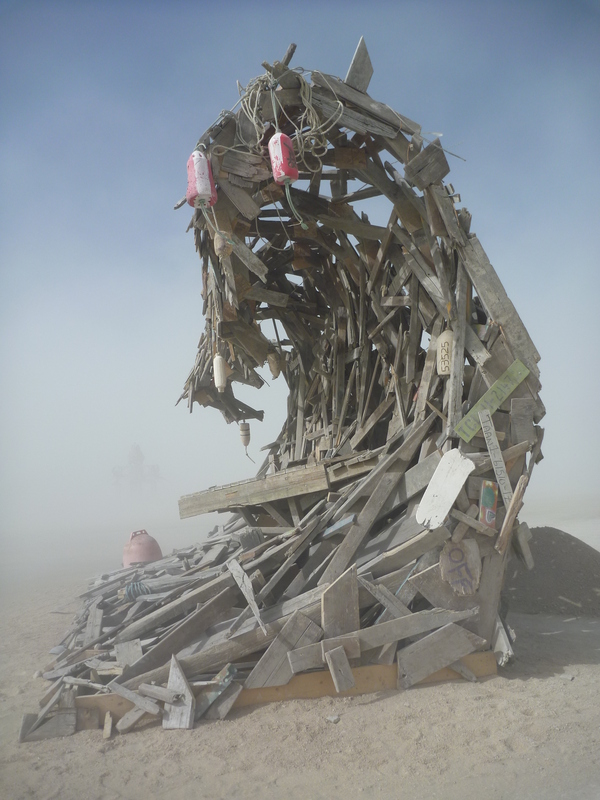 The Breaking Wave stood for three days August 27 to 29, just off the Esplanade, at approximately the 4:00 entrance to Black Rock City. 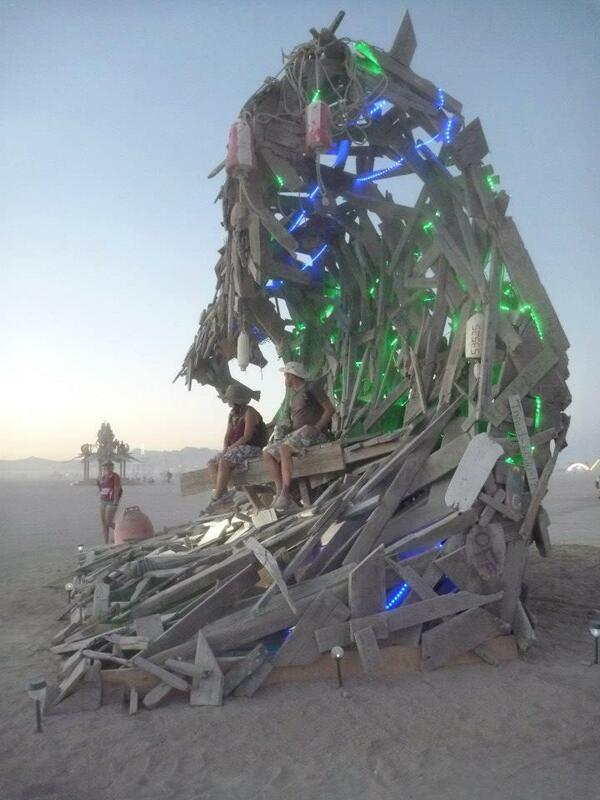 We burned the Sculpture on Wednesday midnight in a brief and very hot conflagration watched by several thousand people. 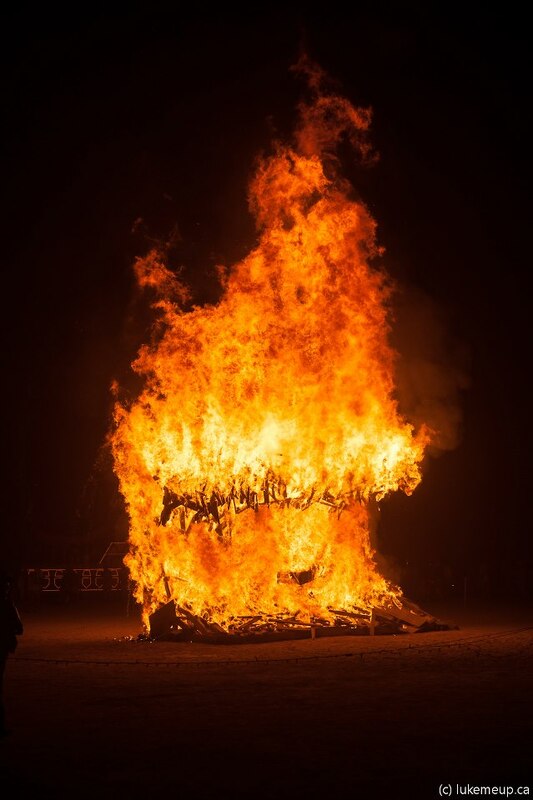 Feedback from the Burning Man Organization indicated our presentation of the art and the burn were perfect regarding execution, fire safety, and cleanup. The core members of the crew in alphabetical order were Kevin Curry, James Deane, Mike Hattingh, Jason Malo and Ron Simmer, with much appreciated help from Amber, Brandon, BT, Curtis, Greg, Jessica, Lilli, Ryan, Matthew, Percilla , Yvonne , Vertumnus and many other volunteers from Washington and Oregon. Ryan McCann of Documonkey TV has produced a Breaking Wave video documentary. The Breaking Wave project received no cash honorarium from the BM Org., and was financed in part by the art crew through fundraising efforts. We did receive grants from the Greater Vancouver Interactive Arts Society, while several of the crew made sizable personal expenditures in the thousands of dollars. 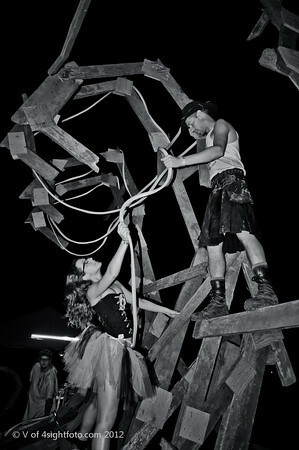 All of the crew were motivated by their determination to deliver an outstanding art piece to the Burning Man Festival. The logistical problems in collecting and transporting such a large volume of wood were crushing but the crew came together and built a unique and amazing work of art. 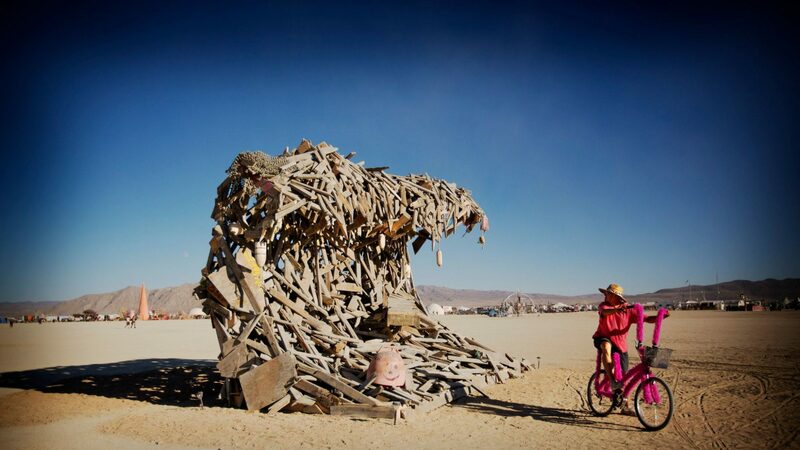 It is part of the Burning Man legend as a statement against ocean pollution. 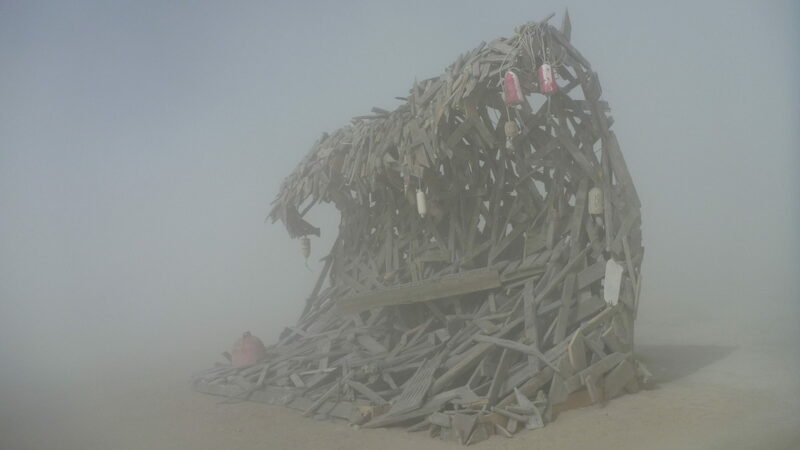 The Breaking Wave sculpture created for Burning Man was inspired by the classic Great Wave of Kanagawa by Japanese painter Hokusai. We tried to capture and embody the image of Hokusai`s wave as a giant attacking claw. Mariners have always feared breaking waves as a sign of dangerous sea states or deadly shoals; the sculpture was intended as a tribute to those who lost their lives in the Japanese Tsunami of 2011.